Topic 1 - Introduction > How innovative are you? > How innovative are you? 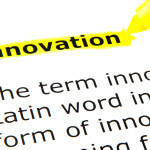 Topic 1 – Introduction > How innovative are you? > How innovative are you? Eight out of ten of us in surveys feel that creativity is critical to unlocking global economic potential. How many of us feel we’re living up to our maximum creativity? Stop and think. Realistically, which floor do you feel you now occupy with your current level of creativity? The proportion of respondents reporting that their innovative thinking is where they wanted to be is only one in four. In this class, you’ll learn to think more innovatively than you do today. You’re soon to become trained in a method that will make you a more skilled original thinker. Obtaining expertise at innovative thinking comes from practice. The term innovation is so intimately related to progress that’s come to be flaunted by anyone wanting to brand themselves as successful. Innovation is plastered on everything new and sought after, from the trendiest business process to the hottest buy. Making existing product or processes better, faster, or cheaper is one flavor of innovation. Innovation has made paupers into millionaires and it’s radically change the world What is this wonder called innovation? Most definitions consider it creativity with a use. Still, we use the terms innovation and creativity so synonymously that in this course, I’ll often use them interchangeably myself. Whether the definition of innovation involves creativity or surprise, it’s a skill worth pursuing. We begin with an overview of the innovation generation process. Eggbert will keep reminding us of the innovation steps, which go by the shorthand, PIG In MuD. What are we trying to accomplish? Exactly what problems are we wanting to solve? The best problems are plausible, actionable and useful, terms we’ll define when we get to this step. To diverge in our thinking, we’ll need the help of a whole toolbox. Analogy – compare solutions to similar problems from elsewhere. Reverse start thinking by asking the negative of the question or thinking about the problem backward. Lateral thinking- move across idea space by considering bizarre and interesting possibilities. See if you can apply frame shifting, as well as the tools of observation, analogy with organization and rearrangement, lateral thinking, and groups to expand your idea space for solving the problem posed by Dana Air. There’s strong research that carefully crafted creativity training programs work. Although you’ll also find key elements here that you won’t find anywhere else. In business settings, innovation training made professionals more interested in novel solutions and more flexible in their approaches. The best creativity training programs equip students with discrete tools, explain through examples, and involve meaningful practice exercises, all of which we’ll do here. Discussion of the case of Volaris, a Mexican domestic air carrier, using the steps laid out in PIG In MuD. PIG in MuD is the abbreviation for the steps to enhancing innovative thinking. Finally, we very briefly reviewed evidence that innovation training works. Stick around next week as we go deeper in understanding and applying the first step, defining our problem.